Package includes: 6pcs 8"-3pcs Light Pink and 3pcs Dark Pink. 6pcs 10"-3pcs White and 3pcs Dark Pink. 6pcs 12"- 3pcs White and 3pcs Light Pink . Main Features: The main features of these pom poms set include: 100% new brand and high quality. 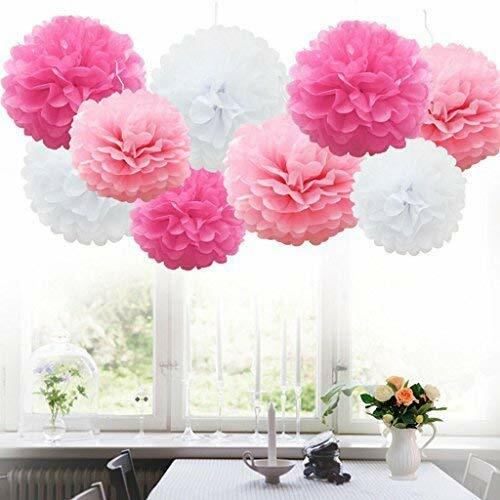 Totall 18pcs paper flowers poms mixed 3 sizes (8",10",12") and 3 colors (light pink,white,dark pink) Hand made using premium paper. Each pom pom comes with white ribbon and instructions. Pre-cut pieces for easy folding each sheet and fluff into shape to create beautiful and realistic paper flower pom-poms. Lightweight and easy to hang them from the ceiling, above a table, under the verandah, or from branches in trees. Perfect for any occasion: Birthday, Wedding, Christening Baby shower, Kitchen tea, Nursery decorations or any other celebration. 18Pcs 12 Inch, 10 Inch, 8 Inch Assorted Rainbow Colors Tissue Paper Pom Poms Flower Balls . Package includes: 3 pcs Small paper pom-poms (8", light pink) + 3 pcs Small paper pom-poms (8", dark pink) + 3 pcs Medium paper pom-poms (10", white) + 3 pcs Medium paper pom-poms (10", dark pink) + 3 pcs Large paper pom-poms (12", light pink) +3 pcs Large paper pom-poms (12", white). Application: These beautiful paper pom-poms are wonderful decorations for festival and party. Perfect for any occasion, such as Birthday, Wedding, Christening, Baby shower, Kitchen tea, Nursery decorations or any other celebration. Easy to assemble: The tissue pom-pom is individually packed, and it is very easy to operate with instruction. It is packed flat and what you need to do is to fluff it out and hang. Material: The quality of all items is very well, since they are made of environmental pure wood pulp. Caution of fire. Please note that colors may vary slightly from images because of various factors like lighting, monitor, manufacturer batch color variation. Perfect DIY combination: Use this gorgeous decorative paper at your party, you can create a wonderful backdrop for your family or friends. If you have any questions about this product by Nature World, contact us by completing and submitting the form below. If you are looking for a specif part number, please include it with your message.